Coraline is a dark children's story that's not for the faint of heart. It centres around a remarkable little girl, Coraline Jones who moves with her parents to a new home which holds a secret door. 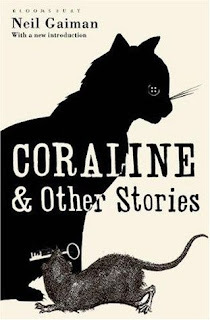 Coraline has gone on to win the 2002 Bram Stoker Award for Best Work for Young readers, the 2003 Hugo Award for Best Novella as well as the 2003 Nebula Award for Best Novella. This is the third book I have read by Neil Gaiman and as usual I have not been left disappointed. Neil Gaiman possesses an extraordinary ability to take one of his unique characters and just leave them all alone in a most ridiculous situation facing the most dire circumstances. I have to admit when I read his books I always think this character will never find their way out of this hell hole. The plot seems too preposterous, Gaiman will never get out of this alive. But each time he creates these fantastic stories. His stories are so strange believable. They seem to write themselves. I am incredibly jealous of his writing. Whilst reading this I had to check it was actually a story aimed at children. It is so dark and disturbing but a delight to read. If I was a child reading this I would be sh*t scared, and I agree completely with Gaiman who has said that it is good for children to scared, "as long as the fear is on the page." It has an incredible gothic feel and utterly absorbing. I kept praying that Coraline would just wake up and see that it was all just a dream. I really felt like I was stepping into another world, and that's what I love about reading. But Coraline is so much more than a scary tale, as Gaiman himself has said, "it is not a story about fear, but one about bravery."